Chapter 3 What did Champlain see in the “Cape of Islands”? This is Whale Cove today, looking toward Straitsmouth Island. It’s on this expedition that the French gave the name Cap aux Iles, Islands Cape. Champlain’s map also shows our familiar harbor seals and a swordfish in what is now the head of the harbor! But we are left with so many questions! Why was Champlain here? What did he think of the Pawtucket and how and why did his views change? What kind of clothes were they wearing that they washed at Rocky Neck? And what’s all this about arquebusiers and an ambush? Champlain also describes the plants and animals and the Algonquian’s corn plantations on cleared land; hillsides covered with currants and grapes; stands of hickory, beechnut, and walnut trees; feasts of passenger pigeons (which flocked in the millions and are now extinct); and useful communications with the natives of Cape Ann. His later encounters with the Pawtucket, however, were fraught with misunderstandings and suspicions. 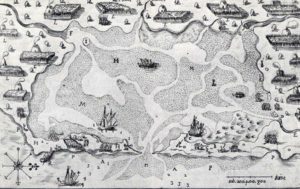 Champlain’s map of Le Beauport immortalizes an incident in which he discovers a suspected Indian ambush and his lieutenant Poutrincourt and their arquebusiers (marines with front-loading, smooth-bore, matchlock guns) form a defense. What really happened, and why? We need to know more to answer this question, but based on their meddling in Native politics and mishaps on Cape Cod, the Frenchmen may not have been overreacting! A central figure near “V” waving his arms is Champlain as he portrayed himself. 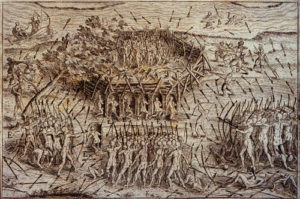 The “savages” are shown dancing in a circle to the right, and the “musketeers” (arquebusiers) are in formation at “T” at the bottom of the inset. 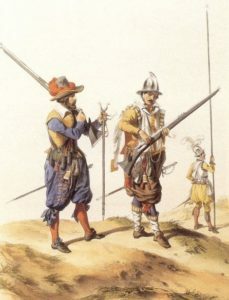 Early arquebuses were too heavy to hold, load, and fire from the shoulder and had to be propped with a monopod. Later versions were lighter-weight muskets with various improvements to the firing mechanism.17 Imagine the Pawtucket hearing a round from an arquebus and watching the Frenchmen wash these clothes. 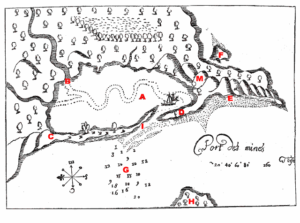 Messamouet led Champlain to the copper mine at E on this map of Port aux mines in Maine. Between 1605 and 1635 the Tarrantines devastated coastal populations, including the Saco in Maine, the Pawtucket on Cape Ann, and the Massachuset to the south. The northern raiders always had superior force, because the French were trading guns for furs at Tadoussac, the center of the fur trade on the St. Lawrence, down-river from Quebec. The Pawtucket sagamore who met Champlain at Gloucester Harbor in 1606 was Quiouhamenec (pronounced Kwee oh ham en ek), who probably had just received the news of the French-abetted Tarrantine attack against their allies the Saco the previous year. Things started well. 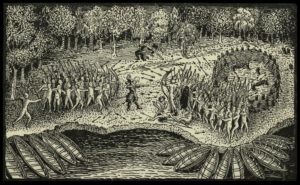 Champlain then reports an odd occurrence in which a Saco sachem (Onemechin on a surprise visit, no doubt arriving to confront Quiouhamenec about his dealings with Champlain), refuses Champlain’s gift of a jacket. Onemechin tries on the jacket, takes it off, puts it on, takes it off, indicating discomfort, and finally hands it over to a subordinate. By neither accepting nor rejecting the gift, Onemechin creatively avoids the twin catastrophes. Champlain surmises only that savages are not used to wearing clothing. Whether or not this interpretation is correct, relations between the “Indians” and the Europeans undoubtedly were studded with many such communication errors and misunderstandings throughout the contact period. Cross-cultural miscommunication is a whole field of study, and gift giving and reciprocity universally play important and complex roles in human relations. In any case, the alleged “ambush” incident at Rocky Neck happened the very next day, and Champlain sailed away, never to return. Replica of the Don de Dieu during the 300th anniversary of the founding of Quebec City in 1908. The barque that Champlain sailed into Gloucester Harbor in 1606 was a different ship of the same size and design. Champlain’s map of the St. Lawrence River system and the Maritimes, for example, shows wigwams as hills representing Native American settlements of different sizes. Champlain’s route to the Massachusetts coast took him from Port Royal in Nova Scotia, past Acadia toward Casco Bay. He stopped in Penobscot harbor and made this map. 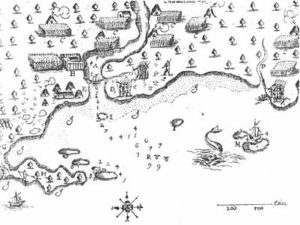 There is Indian Island in the river, showing the layout of the village in Old Town, Maine, at that time. 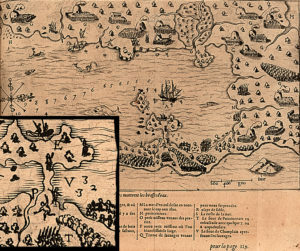 His map of the estuary of the Saco River in Maine shows the Abenaki corn plantations and flake yards of Onemechin’s people, and some warriors, as well as a grampus (a kind of North Atlantic porpoise) and a whale in the bay. 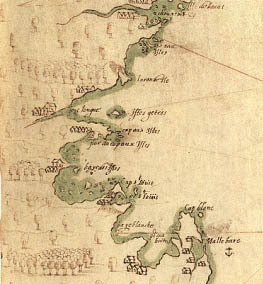 Champlain’s map keys often described specific events at the harbors he drew. For example here is a map of Stage Harbor in Chatham, or Monomoit, which Champlain called Port Misfortune. It traces an event in 1606 after leaving Cape Ann that contributed to Champlain’s decision to take Cape Cod, as well as Cape Ann, out of the running for the capital of New France. Here the French put ashore to explore and some men are left behind to bake bread. People who later became known as the Wampanoag attacked by surprise. They had gotten word of events at Mallebarre. There at Nauset the French had killed some Indians as a result of a misunderstanding over a copper pot that had left one Frenchman dead. Now we can answer the question that opens this chapter. All of Champlain’s maps from Quebec to Cape Cod show that he saw heavily populated harbors and river mouths. They prove without a doubt that Native Americans in considerable numbers (between 200 and 2,000 at any given site) were living in coastal and interior New England prior to colonial settlement, and from southern Maine southward they were practicing agriculture. Now a new question: Who else came here before the Friendship landed Dorchester Company fishermen at Gloucester’s Fishermen’s Field in 1623, and what did they see? 1604-1610, especially for his descriptions of Le Beauport and encounters with the Indians. See http://canadachannel.ca/HCO/index.php/Champlain’s_Voyages,_Translated_by_Charles_Otis,_Vol._II_1604-1608#cite_note-230 . See also Langdon and Ganong’s 1922 edition of The Works of Samuel de Champlain, published by the Champlain Society (www.champlainsociety.ca ), and Henry Biggar’s six volumes, The Works of Samuel de Champlain, prepared between 1922 and 1936 and reprinted in 1971 by the Toronto University Press. In these editions, Champlain writes volume 1 in 1599, volume II in 1603, volume III in 1613, and the last three volumes in 1632. 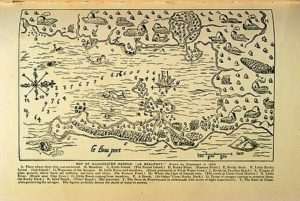 The original of Champlain’s map of Gloucester Harbor is in the Archive of Early American Images and Maps Collection at the John Carter Brown Library, Brown University, Providence, RI, and versions of it can be readily found in Google Images. 2. Champlain anchored in what would become Boston Harbor but did not go ashore there. He sailed to Plymouth Harbor, then skipped Cape Cod Bay entirely and ended his New England landings at Nauset Beach. The map shows seven of his voyages of discovery between 1603 and 1624. See the Prince Society 1878 edition of Otis’s translation of Volume I of Voyages, edited by Edmund Slafter (available at http://www.gutenberg.org/ebooks/6653 and http://www.americanjourneys.org/aj-115/index.asp ), which includes maps and illustrations. 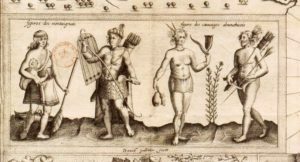 An accessible French source is Des Sauvages: ou voyage de Samuel Champlain, de Brouages, faite en la France nouvelle l’an 1603 (“Concerning the Savages: or travels of Samuel Champlain of Brouages, made in New France in the year 1603”), which describes Champlain’s first voyage to Canada as the guest of François Gravé du Pont, who was in search of the Northwest Passage. 3. 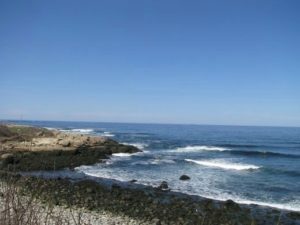 The stories of Epenow and other Native abductees from the New England coast are told in Chapter 22. 4. Other voyages of discovery to New England and the Northeast are the subject of Chapter 4. 5. From Part IX of Volume II of the Otis edition of Champlain’s Voyages. 6. The same six chiefdoms of the Massachuset were later identified in other contexts by Edward Winslow (Mourt’s Relation 1622), Thomas Morton (New English Canaan 1632), Roger Williams (A Key into the Language of America 1643), Samuel Maverick (A Briefe Description of New England 1660), and Daniel Gookin (Historical Collections of the Indians of New England 1674). These are all available online. 7. The principal primary source for the ethnography of the Indians of New England, other than the first governors of the first colonies, is Daniel Gookin, the first Indian agent of the Massachusetts Bay Colony. See his 1674 account (Published in 1692, reprinted in 1792 and 1806), Historical collections of the Indians of New England and their several nations, numbers, customs, manners, religion, and government before the English planted there (Massachusetts Historical Society Collections): http://digitalcommons.uri.edu/sc_pubs/13/ . 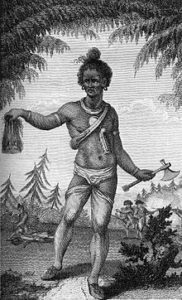 See also the early historian William Hubbard’s 1801 work, A Narrative of the Indian Wars in New England 1607-1677 (Greenleaf) and Wendell Hadlock’s 1947 article, War among the northeastern Woodland Indians, American Anthropologist 49 (2). 8. Biographies of Champlain I consulted included Samuel Eliot Morison’s 1972 classic, Samuel de Champlain: Father of New France (Little Brown) available at http://www.jstor.org/pss/1918378 and David Fischer’s 2008 tome, Champlain’s Dream (Simon & Schuster), although I found the latter too hagiographic to my taste. 9. 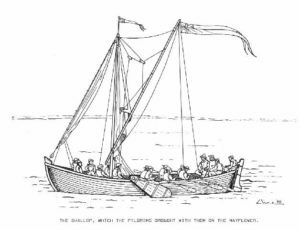 For information on shallops, pinnaces, and other types of colonial and early American vessels, see, for example, Howard Chapelle’s 1951 article and others in American Small Sailing Craft: Their Design, Development, and Construction (W. W. Norton). The 2006 illustration of a shallop under sail is by Duane A. Cline. and the 1633 illustration of “mosquetero, piquero, and arcabucero” attire is in the Digital Gallery of the New York Public Library. A, The place where our bark was anchored. B, Meadows. C, Little Island. (Ten Pound Island.) D, Rocky Point. (Eastern Point.) E, The place where we caulked our boat. (Rocky Neck.) F, Little Rocky Island. (Salt Island.) G, Wigwams of the savages, where they cultivate the earth. H, Little river, where there are meadows. (Brook and marsh at Fresh Water Cove.) I, Brook. (Brook which enters the sea at Pavilion Beach.) L, Tongue of plain ground, where there are saffrons, nut-trees and vines. (On Eastern Point.) M, The salt water from a place where the Cape of Islands turns. (The creek in the marsh at little good harbor.) N, Little river. (Brook near Clay Cove.) O, Little Brook coming from meadows. (This brook cannot now be exactly located.) P, A little brook where they washed their linen. (At Oakes’ Cove, Rocky Neck.) Q, Troop of savages coming to surprise them. (At Rocky Neck.) R, Sand beach. (Niles’ Beach, at Eastern Point.) S, The sea-coast. (Back side of Eastern Point.) T, The Sieur de Poutrincourt in ambuscade with seven or eight arquebusiers. V, The Sieur de Champlain perceiving the savages. 11. 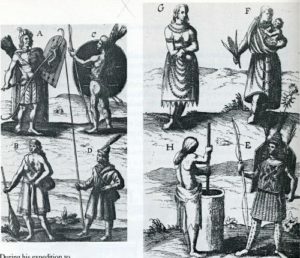 Champlain’s sketches of Indians along with his descriptive keys may be seen at http://www.archives.gov.on.ca/en/explore/online/franco_ontarian/contacts.aspx from Volume 4 of G. -E. Desbarats’ 1870 work, Oeuvres de Champlain (2nd ed., Archives of Ontario Library), facing page 81. 12. See Marc Lescarbot. 1606 (2013). 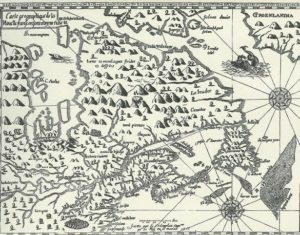 Nova Francia: A Description of Acadia, 1606. New York: Routledge. 13. From Part XIII of Otis’s translation of Champlain’s Voyages. 14. Champlain’s observations of Spanish colonialism in the 16th century are in Slafter, Rev. Edmund F. 1878. Voyages of Samuel de Champlain, Volume I: 1567-1635. 15. From Part VII of Volume II of the Otis edition of Champlain’s Voyages. 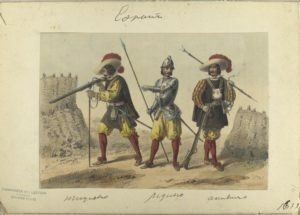 Sellswords, mercenaries, and condotierri, They Shot at the Skies: Soldiers and Firearms of 16th Century at http://sellsword.wordpress.com/2011/08/09/firearms/ . 17. An authoritative source on early firearms is Charles Black’s translation of Auguste Demmin’s 1877 An illustrated history of arms and armour (a free read in Google Books). 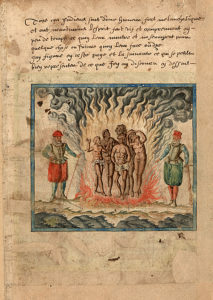 The 1633 illustration of “mosquetero, piquero, and arcabucero” attire is in the Digital Gallery of the New York Public Library. 18. Events surrounding Champlain’s departure from Cape Ann are described in Part XIII of Volume II of Otis’s translation of Champlain’s Voyages. In a letter to his monarch, also in Voyages, Champlain cites unpredictable natives and relative scarcity of fur-bearing animals as his reasons for seeking elsewhere to plant New France. A historical marker near the entrance to Gloucester’s Rocky Neck commemorates his visit to Le beau port. 19. Champlain describes the quest for American copper mines in Part III of the Prince Society edition of Voyages. Sources of metals and minerals, along with an abundant supply of furs, dictated the location of a capital for New France and at the same time muddied inter-tribal relations among native Americans. Sources on the French fur trade and its impacts on Native Americans of North America include Dean Snow’s 1976 article, The Abenaki fur trade in the sixteenth century in The Western Canadian Journal of Anthropology 6 (1); Colin Calloway’s 1991 Dawnland Encounters: Indians and Europeans in northern New England; Robert Grumet’s 1995 Historic contact: Indian People and Colonists in Today’s Northeastern United States in the Sixteenth through Eighteenth Centuries; and Thomas Nixon’s 2011dissertation, The North American Fur Trade and its Effects on the Native American Population and the Environment in North America (see http://adr.coalliance.org/codr/fez/eserv/codr:745/RUGFM018.pdf ). 20. See David Allen’s 2005 French Mapping of New York and New England 1604-1760 at http://purl.oclc.org/coordinates/a1.htm . And Bernard Hoffman’s 1955 Map of Native Territories in 1700, in Souriquois, Etechemin, and Kwedech–A Lost Chapter in American Ethnography, in Ethnohistory 2 (1). For a perspective on ethnicity in the Northeast, see Bruce Bourke’s 1989 Ethnicity on the Maritime Peninsula 1600-1759, in Ethnohistory 36 (3) and Olive Dickason’s 2009 general reference, Canada’s First Nations: A History of Founding Peoples from Earliest Times (Oxford University Press). 21. 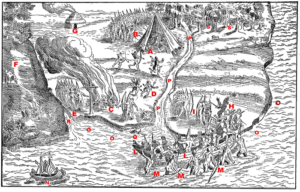 A more complete account of this interaction and its potential for cross-cultural misunderstanding is given in Marc Lescarbot’s 1607 account, Defeat of the Armouchiquois Savages by Chief Membertou and his savage allies (translated by Thomas Goetz), in Papers of the sixth Algonquian conference, William Cowan, ed. (Carleton University, 1974). 22. For a perspective on conflict between Northeastern hunter-gatherers and New England horticulturalists, see Bruce Bourke and Ruth Whitehead’s 1985 article, Tarrentines and the Introduction of European Trade Goods in the Gulf of Maine, in Ethnohistory 32 (4). 23. The quotation is in Part XIII of Vol. II of Otis’s translations of Voyages and also on pages 6 and 7 of Morris Bishop’s Samuel de Champlain: The Life of Fortitude (Knopf, 1948). 24. 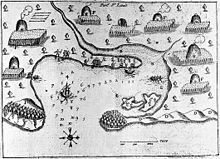 Primary source accounts of Tarrantine raids on New England are in the papers of John Winthrop and John Winthrop Jr. Tarrantine raids on Cape Ann are also referenced in John Goff’s 2008 article, Remembering the Tarratines (sic) and Nanepashemet: Exploring 1605-1635 Tarratine War Sites in Eastern Massachusetts, in The New England Antiquities Research Association Journal, 39 (2). See also William Haviland’s 2010 Canoe Indians of Down East Maine (The History Press). 25. 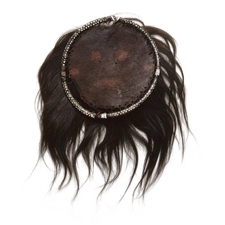 Scalping and scalp collecting were practiced in North and South America in pre-Columbian times in highly ritualized cultural contexts as an expression of a warrior code of conduct, including the scalplock hairstyle and collection of coups, during raids on other native people. The practice was transformed following European contact into acts of retribution performed by both Indians and colonists on combatants and non-combatants alike, often for bounty money. Popular present-day interpretation has it that colonists taught scalping to the Indians, but this simply is not true. Sound sources on this subject include James Axtell’s 1982 The European and the Indian: Essays on the Ethnohistory of Colonial North America (Oxford University Press); John Grenier’s 2005 The first way of war: American war making on the frontier, 1607-1814 (Cambridge University Press); and Richard Burton’s 1864 ethnographic “Notes on Scalping” in Anthropological Review (http://archive.org/stream/jstor-3025136/3025136#page/n1/mode/2up ). 27. For a perspective on unintended impacts of French contact on relations among the Indians, see Champlain’s Legacy: The Transformation of Seventeenth-Century North America, in The Dominion of War: Empire and Liberty in North America, 1500-2000, by Fred Anderson and Andrew Clayton (2005) and Colin Calloway’s 2013 New Worlds for All: Indians, Europeans, and the Remaking of Early America (Johns Hopkins Press). 28. Champlain’s map of Gloucester Harbor is surprisingly accurate, based only on his astrolabe readings and pacing off of the land. 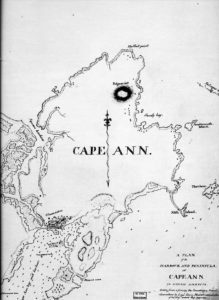 Captain John Smith’s mapping of Cape Ann is described in more detail in Chapter 4 of this book. The original of Champlain’s 1607 map of the Northeast from Cape Sable to Cape Cod is in the Library of Congress. 29. French and other historical units of measure are explained in Measure for Measure by R. A. Young and T. J. Glover (Blue Willow, 1996). 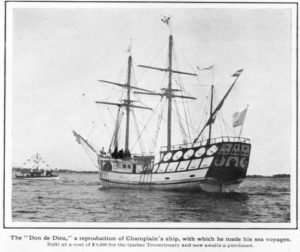 The vessel that Champlain moored in Gloucester Harbor may have been the Don de Dieu, described in William Wood’s 1915 All Afloat: A Chronicle of Craft and Waterways, or possibly a smaller barque built on the St. Lawrence specifically for exploring the northeastern coast, with an even smaller oared vessel in tow—a shallop or pinnace—for exploring up rivers en route. 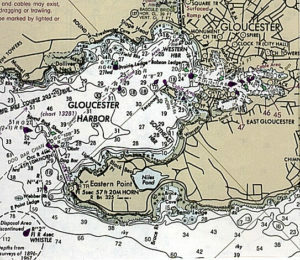 The contemporary map of Gloucester Harbor is a detail from the NOAA Nautical Chart for Ipswich Bay to Gloucester Harbor. The history of Gloucester Harbor, a fascinating study in itself, is found in publications of the Massachusetts Office of Coastal Zone Management, including a 2000 report, Review of Depth to Bedrock in Gloucester Inner Harbor and The Environmental History and Current Characteristics of Gloucester Harbor by Anthony Wilbur and Fara Courtney (2001): http://www.mass.gov/czm/glouc_harb_rpt_ch1.pdf . 30. Champlain’s maps have been gathered in the Osher Map Library, including engravings of his maps of the St. Lawrence and the Saco River. 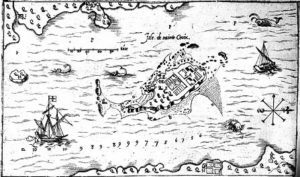 : http://www.oshermaps.org/exhibitions/creation-of-new-england/ii-samuel-de-champlain-and-new-france . 31. Champlain’s 1605 map of Plymouth Harbor, which he named Port St. Louis, may be seen on the web site of the Plymouth Colony Archive Project at http://www.histarch.illinois.edu/plymouth/maps.html. See also a description of his visit there at http://www.pilgrimhallmuseum.org/pdf/Champlain_Map_and_Description.pdf. 32. Champlain’s experience at Nauset and his map of Malle Barre are from Part XIV of Volume II of Otis’s translation of Champlain’s Voyages. 33. Champlain named Stage Harbor in Chatham Port Fortune and later Port Misfortune. See https://bostonraremaps.com/inventory/samuel-champlain-chart-chatham-port-fortune/. There are different stories about Champlain’s misadventure there, including an “official” local history that attributes loss of life to the theft of a knife. I have relied on Champlain’s account of what happened there, in which there is an unprovoked Wampanoag attack on men put ashore to bake bread and see to the provisioning of their vessel. The map story of this attack is Marc Lescarbot’s elaboration of Champlain’s original chart of the harbor. 34. 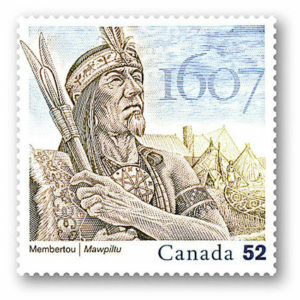 For information on the founding of New France, I relied on Canadian sources, especially W. R. Wilson (2010) Eastern Woodland Indians & the Coming of the Europeans and New France, in Early Canada Historical Narratives at http://www.uppercanadahistory.ca/fn/fntoc.html ; D. Garneau’s History of New France, in Canadian History Timelines (http://www.telusplanet.net/dgarneau/direct.htm ); and the Canadian History Directory (2009), Timelines for the History of New France 1385-1900: (http://www.telusplanet.net/dgarneau/direct.htm ). See also Francis Parkman’s 1983. Pioneers of France in the New World: the Jesuits in North American in the Seventeenth Century, in Volume I of France and England in North America (Library of America). 35. 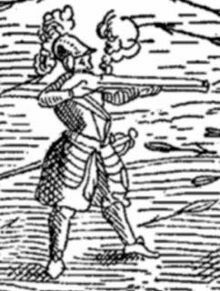 Champlain’s sketch of himself firing his arquebus at an Iroquois war party in 1609 is reproduced in the Otis edition of Voyages and elsewhere. No authentic portrait of Champlain is known to exist. The painting most commonly used shows Champlain as a d’Artagnan-like figure by Theophile Hamel (1870) after one by Ducornet (d. 1856), based on an earlier portrait of someone else entirely by Balthasar Moncornet (d. 1668). Next Next post: Chapter 4 Who Else Came Here and What Did They Find?